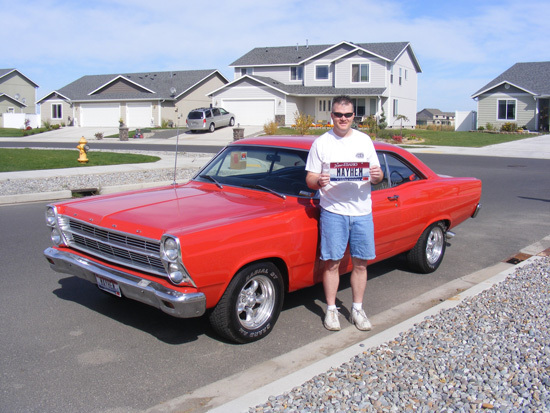 Hello, my name is Russ aka MayHem, and I want to tell you my story on how the automobile, more specifically, classic cars like the Ford Fairlane, have had a huge impact throughout my entire life. I want to express the passion I have for the American Muscles Cars, and more importantly, how these hot rods have influenced my life starting from early childhood years, my teenage/early adulthood years, and my adult life. I remember it wasn’t ever hard for my parents to know what to get me for birthdays, or even Christmas…Hot wheels and any other toys with wheels. I would play for hours on end, and just thought I was on top of the world. I remember one Christmas, I was just as excited as any other child to wake up and see what Santa brought. I remember nervously going down the stairs to see what gifts were under the tree. As I was going down the stairs, I noticed a train set under the tree. I wanted to cry. I was just sure I had been a good boy, and Santa would bring me a slot car set. A train set???? How could he get that wrong??? My parents, must have realized how upset I was, and we went to the store the next day and I was able to exchange the train set for the slot car set I wanted. As I grew older, my cousins and my uncle, introduced me to model car building. I was hooked from day one! I would do anything like mow lawns, shovel snow, odd jobs, recycle cans/pop bottles… anything I could, just to buy a new kit, or more paints and other supplies. While building model cars was a fun hobby, as I got in my early teens, I WANTED to drive those cars. That day FINALLY came when I was old enough to take drivers education and get my driver’s license. I remember being so excited to finally drive. I was 14, and had just past my driver’s exam and got that little identification that says I’m legal to drive. I was ready to drive that ’57 Chevy, or that ’69 Camaro! As I was walking out of the DMV, it was about that time, when I realized, I don’t have one of those cars. I only have that ‘thing’ my parents called a car. A 1972 Chevy station wagon. I was so embarrassed and refused to drive the ‘un-cool’ car. Then the day came. 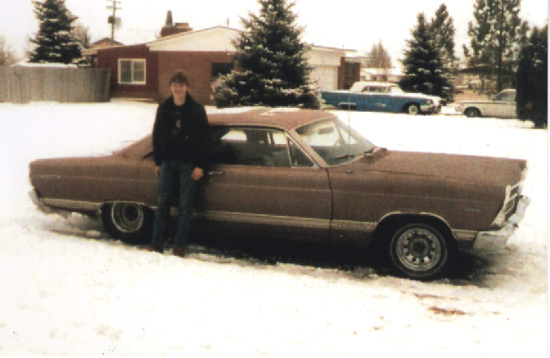 My first real car… With help from my parents, I saved what I could and eventually bought a 1967 Ford Fairlane for $300. I remember thinking this car is so sweet in my own eyes. I know my parents and older sister thought it was a piece of junk! Not me, I was not only thankful to not having to drive a station wagon, but had a car that was cool. Looking back, the car wasn’t in the best of shape, but it would have been a good car to restore. Wow, did I think I was cool! What I remember most, is how cool I felt driving it, and more importantly, the freedom I felt. The status of having a car in school was an added bonus. I remember during my junior year in high school, the car was having mechanical problems and my part time job was not enough to pay the bills. I had no choice during that time, and it was one of my saddest days of my life when I sold that Fairlane. The memories I have with that car in particular are priceless and I will always cherish the joy of those times. After graduation, I joined the military, and while moving across the world and seeing other types of cars that I thought was cool, nothing ever compared to the American Muscle Cars. When I got back in the States, and if I saw any old muscle car, whether restored or not, it would still catch my eye. During my adulthood, you could say I epitomized that saying… ‘the bigger the boy, the bigger the toy’? Wow, that was definitely the truth for me. I have owned and driven a lot of cars. To date, I have owned more cars than the number of years I’ve been alive. I’m 41, so do the math. I write this not to brag. The truth is, I get bored of my vehicles, and I always seem to be looking for another car that can bring back the fond memories/enjoyment I had when I was driving my Fairlane. Some of those dreams and passion for muscle cars had to be put on the back burner over the years. Kids changed the type of cars I needed to drive. I needed the dreaded 4-Door cars and the ‘family cars’. To this day, I still REFUSE to drive a station wagon. I hate them about as much as I hate the Dallas Cowboys (Sorry Dad had to say it!). Over the years, I’d never lost the desire to own my first car again. I told my wife about 10 years before, that if I ever see another Fairlane that we can afford to buy, I will get it. It had to be the same model. Either the ’66 or ’67 Ford Fairlane. A couple of years ago, I went on the most expensive fishing trip in my life. As my brother and I were heading to the lake, I saw THE CAR on the side of the road for sale. I had found it! That gem I was looking for. It was almost like finding the ‘Holy Grail’. I spent that whole trip talking about how I’m going to get that car. I had no doubt in my mind that I am getting it!!! One huge problem…how was I going to convince my wife to let me buy it. Needless to say, my lovely wife knew what it meant to me, and she even encouraged me to purchase that gem, that 1966 Ford Fairlane! When I get behind the wheel of that car, I can’t help but smile, and remember the good times I had during my teenage years. While it hasn’t been the best of road trying to get my car restored to where I want it, I’ve had to overcome some adversity on the bad luck I’ve had on who I’ve chosen to work on my car, but it’s looking better every year, and nothing makes me more happy then when people take the time to look at my car and take pictures of it. Just got the Custom Plates! At the end of the day, if my car can bring smiles to others, like it does for me, then I have very few things to complain about. Personally, I believe the American Muscle Cars are to be driven and enjoyed by all and not hidden in some private museum. I hope you have learned a little about me and my passion on the classic car and how I love the Ford Fairlane. I wanted www.myfairlane.com to be a site that other Fairlane enthusiasts can not only enjoy, but help contribute their stories to this site as well. Please send me your photos and your story of your Fairlane, and I will post it on this site.